With the creation of Boschendal’s Werf food garden, as well as long-awaited summer, the wine estate has never been busier. 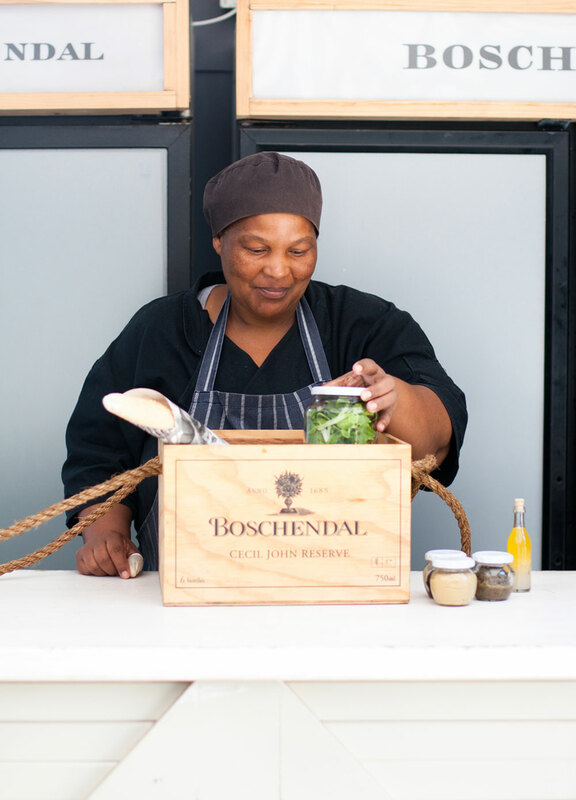 And while there have been many recent changes to Boschendal, one thing is constant, and that is their ever popular picnics which have certainly benefitted from the flourishing Werf food garden. The garden truly is the new star of Boschendal and provides seasonal produce for The Werf restaurant, the Werf and Rhone picnics and the Farm Deli. The Werf picnic area is set up on the vast front lawn, dotted with beanbags and hammocks, and comes complete with a comfy and very chic, striped picnic blanket. Guests make a reservation prior to their arrival and on the day, pick up their basket and choose from any of the exceptional Boschendal wines on offer. 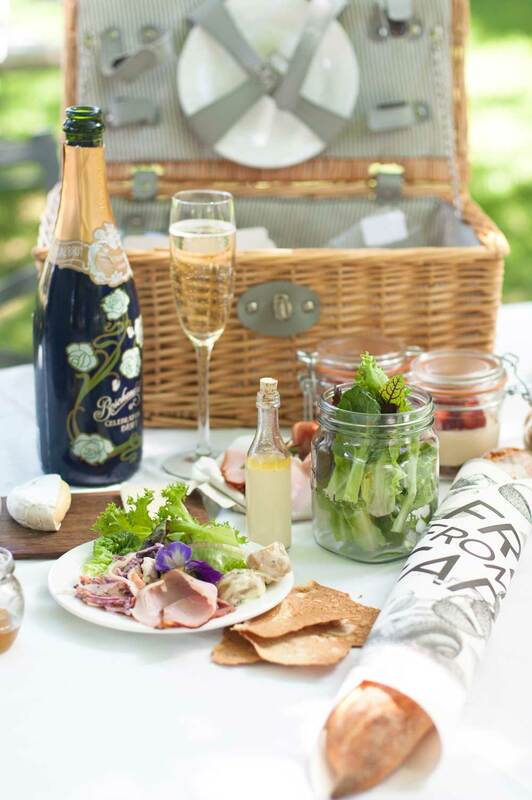 A member of staff then sets up, in a spot of the picnickers’ choosing, and from there all that’s left to do is enjoy the basket of farm fresh treats, perhaps breaking only to order another bottle of wine. The setting is idyllic, with large oak trees dappling the sunshine and offering privacy to each group languishing on the grass. 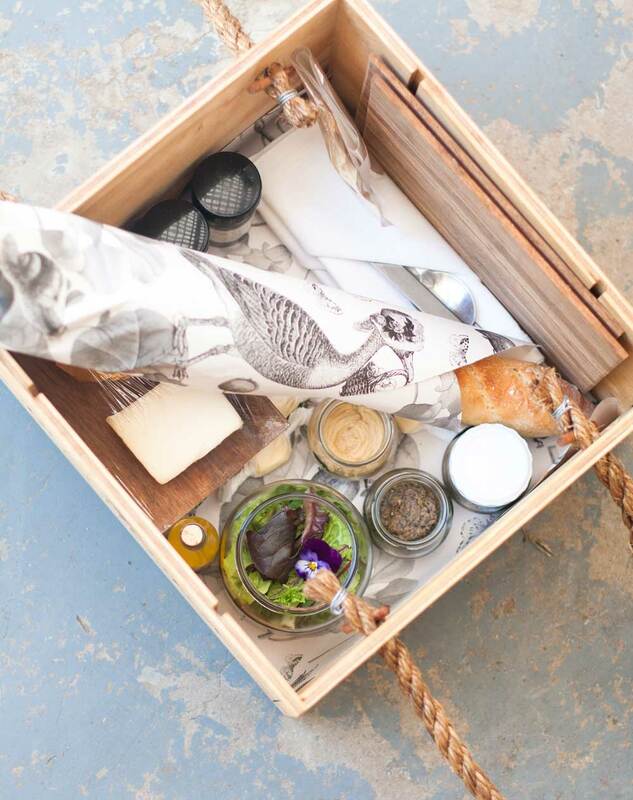 The picnic basket, or more appropriately, the box on offer at the Werf is the perfect culmination of the garden’s bounty and is the ideal light, summer afternoon lunch. It starts with hearty hummus and a creamy chicken liver pate, or an aubergine paté for vegetarians – everything homemade of course. These are accompanied by freshly made, crisp lavashe and a crusty baguette – the perfect vehicle for all of the delicious spreads, as well as the farm fresh butter. Presented in a jar, with its lemon vinaigrette bottled on the side, is the garden salad, featuring the most pillowy, tender and flavour-packed leaves imaginable. The love and care put into the Werf food garden sincerely translates into this mighty little salad. The cold meats included in the basket change often, depending on what the farm’s butcher has available, and are all absolutely delicious; be sure to look out for the salty and creamy picnic ham, one of the butcher’s standouts. Instead of charcuterie, non-meat eaters will be treated to a seasonal vegetable frittata. On the dairy side of things, guests can expect an exceptional choice of two cheeses, both sourced from local farms near Boschendal and for a sweet finish, there is ice cream, made in-house using the freshest whole milk available. On the Rhone side, relaxation and stellar food is also the name of the game but in a marginally different setting. The estate has remained loyal to their classic picnic style, with chairs and tables and a slightly more formal service, where there are waiters on hand to replenish glasses and refresh bottles of wine. As with The Werf picnic, reservations are strongly advised at the Rhone, so that guests can arrive, be shown to their table straight away and can enjoy their feast hassle free. Giant oak trees are also prevalent on this side of the farm but somehow seem much more resplendent in the presence of the Rhone’s colonial-style architecture. The atmosphere, however, is just as relaxed and convivial, with no stuffiness at all, despite the more formal arrangement. In terms of food, the basket delivered to the table is nothing short of generous and is similar to the offering at the Werf, in that there is a paté and hummus served with bread and lavashe along with the same heavenly garden salad. However, the Rhone basket also offers a creamy baby potato salad, along with a refreshing cabbage slaw. To accompany the cold meats, a softly spiced coronation chicken has been added, as well as a mustard mayo ideal for slathering onto a self-assembled sandwich. Guests also receive the same farm-fresh cheese as the Werf picnic, but instead of ice cream they will enjoy a velvety strawberry-topped cheesecake. 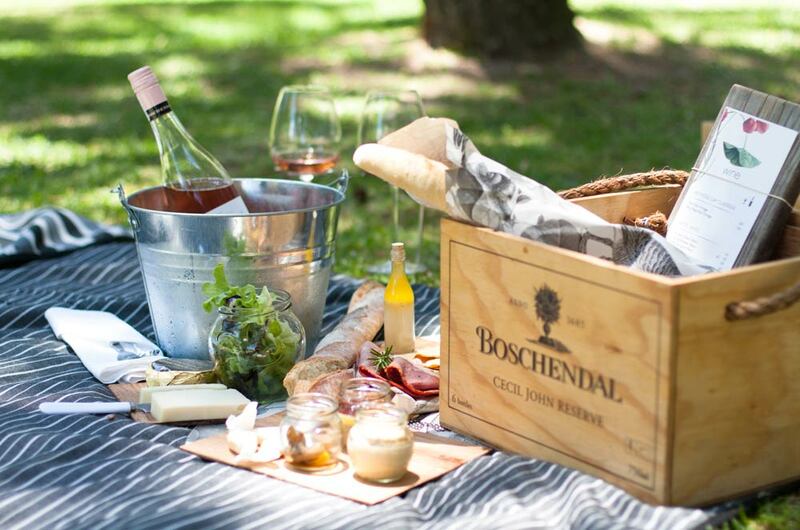 So, whether you’re after a glass of wine and a light lunch in the sun after exploring the Winelands, or you want to kick off your shoes and recline into a hammock, Boschendal has got you covered. The food is homemade and fresher than any store can offer, the wine is simply some of the best available in South Africa and the attention to detail will have you wondering why you ever tried to picnic anywhere else. The only difficult decision you will have to make is whether to visit the Rhone or the Werf picnic spots first. 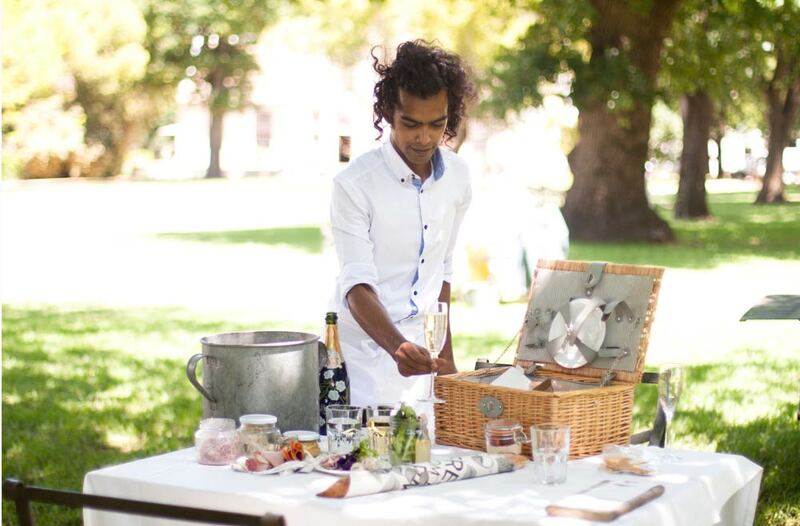 Whichever you choose, know that Boschendal picnics are simply the best way to celebrate summer in Franschhoek, and you definitely won’t be disappointed.